Don’t throw it, sow it! 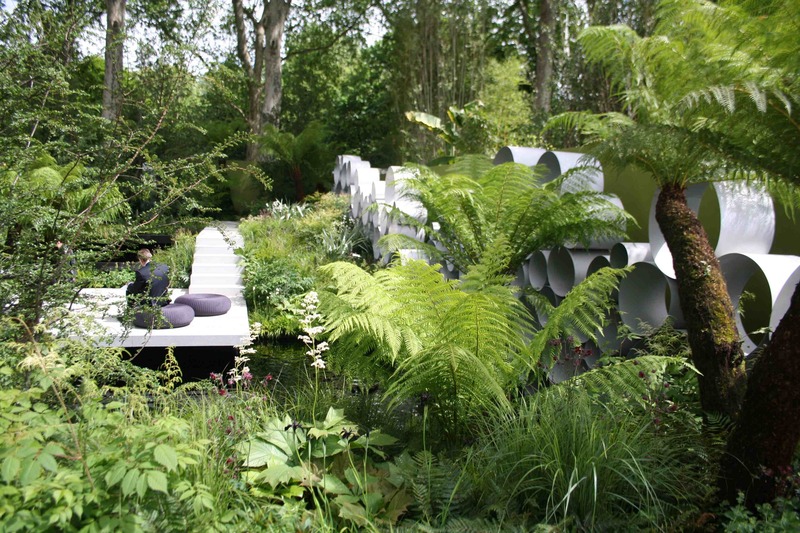 Ah, to be in Chelsea when the show gardens are on show, the loos have no queues and, if you’re beady eyed, you can spot celebrities of the heady calibre of Christopher Biggins, Arabella Weir and Jimmy Nail. Actually, that’s not entirely fair – I did spot Michael Caine trying to hide in a voluminous Barbour and cap (a disguise rather scuppered by the fact he was standing next to his very recognisable wife Shakira), the fragrant Susan Hampshire, Michael Palin and the top of Ringo Starr’s head – though it could have been an Australian tree fern. But press day is not about the slebs, it’s about the gardens and, on my perambulations, I was pleasantly surprised to learn that I have inadvertently created a very fashionable garden of my own here in Greenwich. What I thought was a problem – the fact that nothing is flowering – is, it seems, the very apex of horticultural savvy since pretty much all the show gardens this year are green. Green leaves, green flowers, just green. With maybe a white peony thrown in if you’re daring. The Telegraph garden, Andy Sturgeon’s Cancer Research garden (pictured above) and the Reflective Garden were all stunning, but it was Daylesford Organic’s eccentric wheat field (complete with picturesque poppies and an artful scarecrow, naturally) and burgeoning raised beds of vegetables (pictured below) that had me wanting to screech home, pull up my railway sleeper raised beds and take up an intensive course in willow weaving. 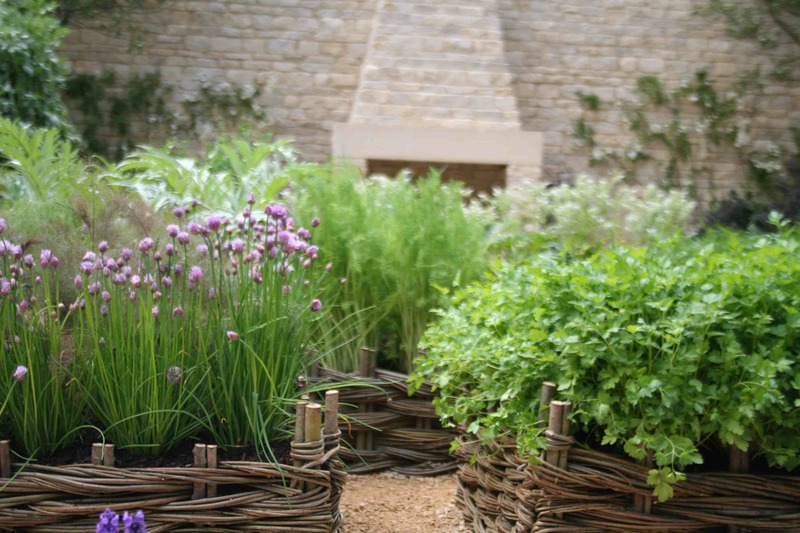 In an arty twist on the old square foot vegetable gardening technique, they’ve gone for a grid of small rustic willow weaved beds, like baskets, filled with gorgeousness – wigwams of broad beans and tomatoes, clumps of flowering chives, structural artichokes, feathery purple fennel etc. Inspirational and aspirational – who knew you could say that about parsley? I suspect an army of 4x4s are screeching out of gravel drives in the Cotswolds in search of blood-veined sorrel as we speak. Other highlights for the vegetable nerd (something I feel I am in good company over since I stood next to Nigel Slater who, for some minutes, was actually jotting down notes while standing in front of a wigwam of Mini Gem squash): Thompson & Morgan and W Robinson & Son’s displays in the Grand Pavilion. Ghastly people alert: Laurence Llewelyn-Bowen and his wife screeching ‘You’ve got to go to the Green Room darling, the GREEN ROOM,’ at everyone they met. Most disappointing show garden award: Diarmuid Gavin’s tedious box ball and allium cafe terrace beneath a swarm of flower umbrellas. Same old, same old. Surprising Titchmarsh in-the-flesh fact: how much makeup are they making that man wear on camera? The poor man looks like he should be in vaudeville. Ooh Nigel Slater and squash, I’m jealous. Grow your own and eat it too!